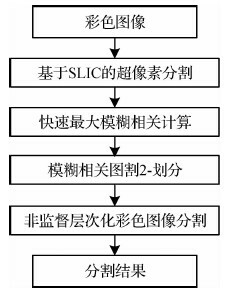 王一斌, 男, 讲师, 博士, 硕士生导师, 主要从事模式识别方面的研究。E-mail:yibeen.wong@gmail.com. Objective Image segmentation is a process of dividing an image into different regions such that each region is homogeneous but the union of any two adjacent regions is not. As the first step in image analysis and pattern recognition, image segmentation serves as a fundamental step in numerous computer vision applications, such as object detection, content-based image retrieval, and medical image analysis. 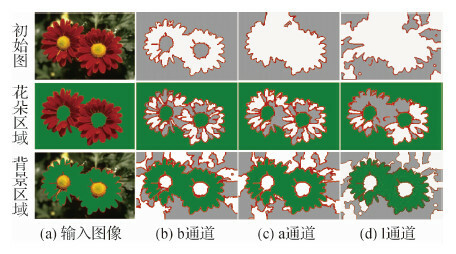 Threshold-based methods, which subdivide the image into several homogenous regions on the basis of pixel intensities, are popular segmentation techniques. Numerous algorithms have been proposed in this direction, which include gray-level thresholding and interactive pixel classification. Among these algorithms, the frequently used maximum fuzzy correlations are widely adopted to measure the appropriateness of fuzzy two partitions for the image segmentation purpose due to the unavoidable ambiguities, fuzziness, and uncertainty of the image information. However, this method has some limitations, i.e., the partition number needs to be preset, the results have isolated noise, and maximum fuzzy correlation approach cannot be extended to color image segmentation. Method Most existing gray-level image segmentation techniques could be extended to color image. They can be directly applied to each component of a color space, and then, the result can be combined in a certain way to obtain the final segmentation result. However, one of the problems is how to use the color information as a whole for each pixel and how to select the color representation for segmentation because each color representation has advantages and disadvantages. 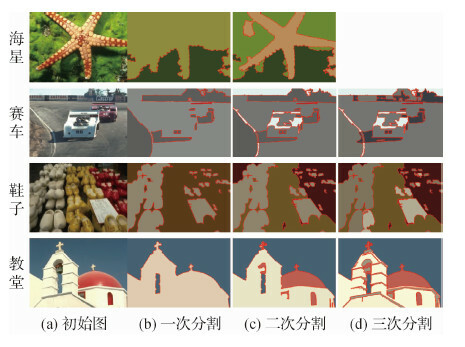 To address these problems, an unsupervised hierarchical color image segmentation through maximum fuzzy correlation and graph cut is proposed. 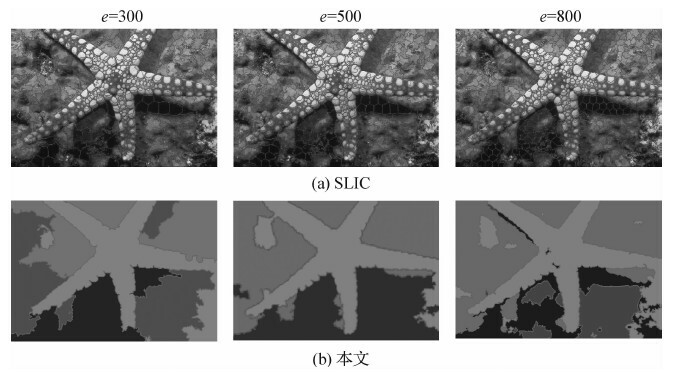 First, we oversegment the color image into superpixels to improve the efficiency of hierarchical image segmentation. Then, we combine the fast fuzzy correlation with graph cut to form a bi-level segmentation operator, which can suppress the isolated noise caused by the single threshold-based approach and enforce the spatial coherence in the thresholding segmentation approach. Here, an iterative calculation scheme is presented to reduce redundant computations in fuzzy correlation evaluation. Finally, a top-down hierarchical segmentation approach has been designed. By iteratively performing this bi-level segmentation operator, multilevel image segmentation is achieved in a hierarchical manner. Starting from the input color image, our algorithm first selects the color channel that can best segment the image into two labels and then iteratively selects channels to further split each label until convergence. 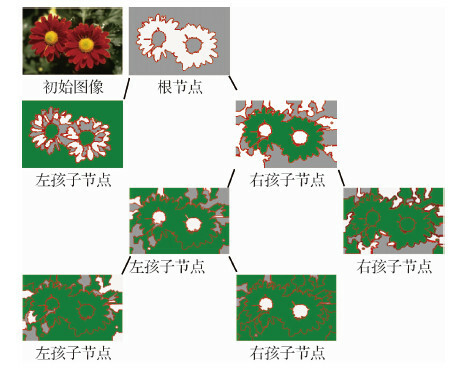 In practice, we partition the 3D color space and adopt the idea of k-d tree to record the segmentation process. Result The presented hierarchical segmentation is implemented in Matlab 7.0. Quantitative and qualitative evaluations are performed to compare with those from the state-of-the-art methods. To test the effectiveness of graph cut on the basis of two fuzzy correlation partitions, we compare our method with maximum fuzzy correlation. The experiment shows that our method can overcome the isolated noise and obtain satisfactory results. To demonstrate the segmentation performance of our algorithm on the color images, the Berkeley segmentation database is used, which consists of 300 natural images of diverse scene categories. We quantitatively compare the performance of our method with existing SAS, Ncut, and JSEG methods. 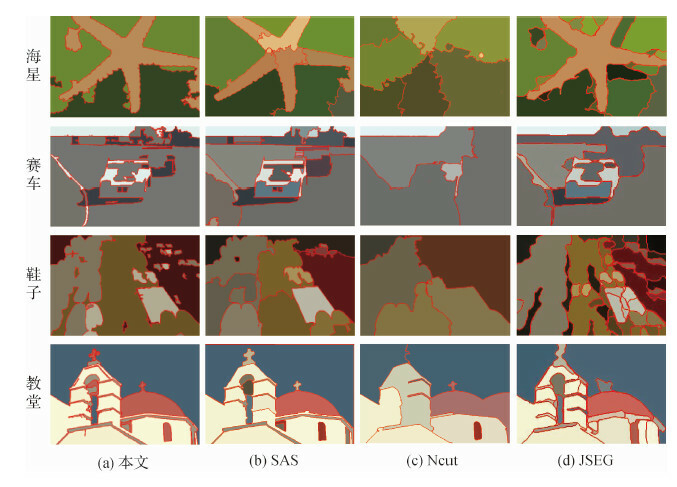 Among these methods, SAS and Ncut are semi-supervised hierarchical superpixel-based color image segmentation methods. However, JSEG is an unsupervised color image segmentation method. By utilizing four widely used metrics, we can find that our method outperforms the Ncut and JSEG methods in terms of precision, and the running time is improved by 20%. Compared with SAS, our method obtains subpar results because it uses only pixel color information and is fully unsupervised. In comparison, the SAS approach uses high-level features, such as texture, edges, and color for segmentation. Conclusion An unsupervised hierarchical image segmentation approach is presented in this paper. The algorithm uses superpixels as segmentation primitives and iteratively partitions all superpixels using a bi-level segmentation operator, which combines fuzzy correlation and graph cut. By using this scheme, the proposed method can effectively handle color images and provide an important reference for the application of the maximum fuzzy correlation algorithm in the field of unsupervised color image segmentation. The limitation of the proposed approach is that it only segments images by using color information, which leads to suboptimal results when the objects and background have similar colors. Utilizing high-level cues in the proposed hierarchical segmentation framework while maintaining it as an unsupervised approach is a non-trivial task. 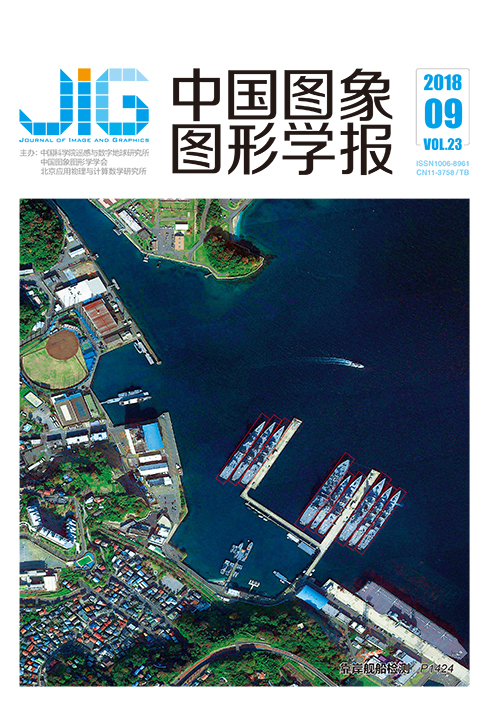 We plan to study this issue as part of our future work.